Welcome to my design Gallery where I post all my challenge and dare pieces, plus a journal of what I do just for fun! 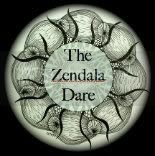 This template, zendala dare 51, is lovely. With zentangle block this morning I am struggling to find a way to use it in a way that I complete the zendala. I have tried at least 8 times and each time I find I put the attempt off to the side wondering if it will come at all. I then decided to try using Easter to find a way. I went to tanglepatterns.com and I used patterns using the letters in the word Easter. E = Ennies, A = Aura - leah, S = Shattuck, T = Twile, and E = I goofed and did an a for Auraknot , R = Rouche (very roughly done). I am not sure that I love what came from the effort but I did accomplish the dare. Weekly Challenge #111: "More-Mooka-Madness Monotangle-Mania"
Do you ever have those days when you want to zentangle....need to zentangle but it is hard to zentangle? I so love Mooka and it usually loves me, however, today I find myself floundering in mooka. I will try again later but for now this is what my day has produced. Thank you Laura for the challenge and may mooka give you all a fun ride. Had family home this weekend and this morning was the first I could get to the dare. It was relaxing to again take pen in hand. Have a great week. Weekly Challenge #110: "Get rid of the box"
It is hard to get a photo without a ton of reflection.....so in editing I inverted the color and this is what happened. I think I will have to play with this more, see if I can figure out a way to use paint or something.....it is cool to have embossed zentangle. I have been wanting to try this for a while and this week's challenge gave me just the right reason to do so. The first photo is after I craved the zentangle into the wood with a rotary tool and then washed the designs with watercolor. The second is the result after staining. It was fun....not exactly the fine work I would love to be able to do but this is my first try and I think I will be able to improve. I edited this one .....a little more contrast. This is the original. The reflection of color comes from my clothes and lightening when it is dark outside. I still haven't gotten the alcohol inks.....but I can hardly wait to give it a try. This one is not embossed...it is the top of the foil where I tangled. I really love this template! Thank you Erin for the dare! Spent today with micron, 12x18 watercolor paper and zentangle! Weekly Challenge #109: "Zentangle Quest"
I do need to work on this challenge....the last photo is one I did on Sat. after I read the zentangle blog! I haven't quite figured out how I want to approach this one. Erin, I so love your dares! This was a fun template to work with. I hope you all have as much fun with it as I have. I am so ready for spring! Weekly Challenge #108: UMT v. XIV "Whyz"
Use my tangle is always a fun way to learn a new pattern. Thanks goes out to Jane the month for her sweet "whyz" pattern. I am still trying to figure it out but it was way fun to work with. I hope you all enjoy this challenge! Sure love you Laura for being here for us! Losing it......literally, I tried so many different approaches and finally decided to piece some of them together...and yet apart! I am a wife, mother, grandmother, clerk, and appreciator of art. Sometimes I try to produce some art myself. Mainly I love the art of others. Doodling has been a big part of my life. Notes were never left unadorned. Now that I have found zentangle....doodling has become more exciting and fun! I hope you enjoy.